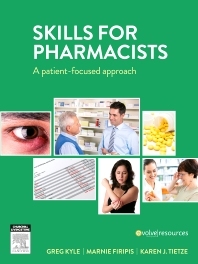 Skills for Pharmacists: a patient-focused approach explores current pharmacy practice and extends into skills for emerging practice areas. The fundamentals of patient-centred care are addressed including communication skills, ethics and evidence-based practice, as well as skills to enhance patient interactions including planning and monitoring drug therapies, physical assessment skills and reviewing laboratory and diagnostic tests. This first Australian edition of the successful US title Clinical Skills for Pharmacists: a patient-focused approach 3e by Karen Tietze builds on the strengths of the original edition while reflecting the needs of undergraduate and postgraduate pharmacy students in Australia, as well as practising pharmacists. • Acronym list for quick reference. • Answers to end-of-chapter case studies.